In China, there is a popular saying which goes “the scenery in Guilin is the greatest under heaven” (桂林山水甲天下). So beautiful are the Karst Mountains around Guilin that, when the Song Dynasty poet Fan Chengda sent paintings of them back to his colleagues, they could not believe what they saw. The name “Guilin” (桂林) is comprised of two characters: “gui”, which means “osmanthus”, and “lin”, which means “forest”. “Guilin” can therefore be translated to mean the “Forest of Sweet Osmanthus” and the city is so named thanks to the prolific number of osmanthus trees that keep the streets and parks smelling so sweet. The lush Karst Mountains, blossoming osmanthus trees, and majestic Li River combine to make an ethereal paradise. It is no wonder people doubted its existence! Guilin is a prefecture-level city in the north of Guangxi and is the third largest city in the region, after Nanning and Liuzhou respectively. The city has a population of nearly 5 million people. It is important to bear in mind that Beijing’s population is over double that of Guilin so, by Chinese standards, Guilin is a relatively small city. It is also home to 14 different ethnic minorities, including Zhuang, Yao, Miao, Dong, and Bai people, to name but a few. This thriving community of Han Chinese, non-Chinese and various ethnic minorities means that Guilin is one of the more culturally diverse cities in China. 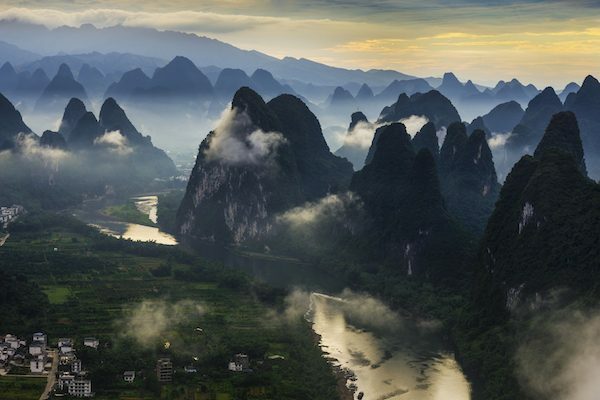 Surrounding the city, Karst Mountains loom up from 100 metres at their lowest to over to 2,100 metres at the peak of Kitten Mountain, the tallest peak in the south of China. This is the source of the Li River; a water-body so magnificent that it was deemed worthy to be printed on the 20 yuan note. 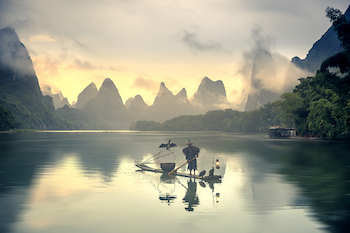 The Li River is not only a thriving tourist attraction; it was the very reason why Guilin was initially settled. In 314 B.C. a small settlement was established on the banks of the Li River. In 111 B.C., during the reign of Emperor Wu of the Han Dynasty (206 B.C. – 220 A.D.), Shi’an County was established on what is considered to be the site of modern-day Guilin. Thanks to the Li River, this county town was developed into a transportation hub during the Tang (618-907) and Song (960-1279) dynasties, as the river was the only way to transport goods from Central China to South China at that time. In 1921 it became one of the main headquarters for the Northern Expeditionary Army led by Sun Yat-sen but it wasn’t until 1940 that it was finally named Guilin. In 1981, the State Council listed Guilin, alongside Beijing, Hangzhou and Suzhou, as one of the four cities where the preservation of historical and culture heritage and the protection of natural scenery should be treated with paramount importance. As you can see, on top of being an area of great natural beauty, Guilin significantly influenced the development of China, and its many attractions reflect this. Jingjiang Princes’ City, Guilin Art Museum, Guilin Museum, and the Li River Folk Custom Centre are just a few of the many places where you can learn about Guilin’s rich heritage. There are also a number of charming parks in the city, such as Black Hill Botanic Garden, Seven Star Park, and West Hill Park, where you can while away a peaceful afternoon and admire the many osmanthus trees. Aside from these wonderful local attractions, Guilin has become popular with tourists primarily because it is only a short trip away from some of the most magnificent places in Guangxi, such as Yangshuo County Town, Daxu Ancient Town, and the Longji Rice Terraces. From ancient transportation centre to modern-day tourist hub, Guilin has always been the heart of Guangxi.